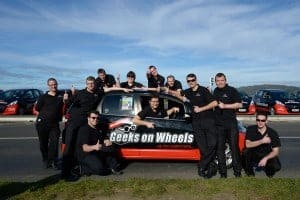 The idea to start Geeks on Wheels was born back in 2005 when there was a obvious gap in the market for a great quality, local computer repair & help service accessible to all computer users, not just businesses. At the time the original owner was involved in developing large websites for overseas companies, working from his kitchen table at home in Miramar, Wellington. There was a time when he needed to quickly buy a network cable to hook up a new printer, so popped down to his local computer shop (that’s no longer in business) and was gobsmacked by the appalling lack of service! Given that he knew exactly what he wanted, he couldn’t help but wonder how other, less technical, people might feel when attempting to get help and assistance with their computing needs. After conducting a little research, it wasn’t too surprising to learn that there was a common perception about computer technicians. They had earned themselves a poor reputation for being condescending, patronising, big-headed, and in some cases downright rude! Amongst the common complaints was that technicians used far too much jargon that the average person couldn’t understand, they didn’t listen, and they didn’t explain things well enough. The public were becoming more and more dependent upon technology, which was, and still is, changing at a forever increasing pace – it was clear that Geeks on Wheels needed to exist, and we needed to provide a fast, efficient, friendly & personal service. Having previously worked as an Authorised Apple Reseller during the 90’s throughout the UK, and having spent a vast amount of time in many peoples’ homes setting up the original Apple iMac when it first launched in 1997. There was already first-hand experience & understanding of people’s requirements, especially when on the steep learning curve with new technology. We quickly became to understand the importance of clarity when conversing with customers. Hiring technicians was a great challenge, as many of the applicants who demonstrated a high level of technical knowledge, didn’t necessarily meet the high standards required for superb customer service & communication skills. As was the case then, and still is the case now, we only ever employ the very best technicians, and we take great care to focus on the on-going training of our technical team to always improve and refine those skills. In October 2005 our first advertisement was published in the Wellington Yellow Pages. On the same day that the new edition was delivered, the phone began to ring and Geeks on Wheels hit the streets. We bought our first car, a Holden Barina, and with our distinctive sign-writing, we were in business! Very quickly it was clear we needed to hire more technicians as the service proved to be extremely popular! Our first ‘Computer Problems?’ billboard in Miramar Cutting drew lots of attention, but after struggling with council red tape trying to get more billboards around other parts of town, we came up with a slightly alternative solution. We bought a 1981 Bedford CF230 which we made-over as an A-Team van to become our now infamous mobile billboard. In 2007, Geeks on Wheels developed a phenomenal training program for our technicians and the growing local call-centre team. We chose to keep our call-centre local in preference of our own dedicated staff that know exactly what we do, and what our technicians can (or can’t) do for our customers. Later the same year we opened for business in both Auckland & Christchurch, and we forged relationships with Vero, for insurance computer repairs, and with Slingshot, launching their ‘Man in a Van’ service. We also entered into a business relationship with TelstraClear providing wireless router installations for their cable network. However, in our endeavour to be truly independent, unbiased, and with our desire to be nothing but the best, we chose to end these arrangements to focus on giving our Customers the best advice & options without having any obligations to business partners. Opening in 2008, our Hamilton branch has grown from strength to strength. As with all our operations, Geeks on Wheels remains focused on a consistent level of service nationwide from its 35+ full-time technicians by sharing information between regions allowing us to grow as one team. Following the Christchurch earthquakes, we remained committed and determined to help the Canterbury region rebuild, and our fabulous Christchurch team of technicians stepped-up with on-going support for our Cantabrians. We opened for business in the Taranaki in 2010 and in Tauranga the following year. 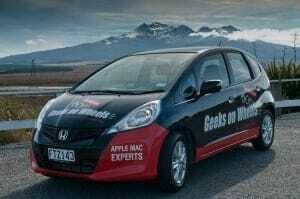 We continue to work on bringing Geeks on Wheels to all other parts of New Zealand as quickly as we can. In 2011 we were invited to write the Help Desk section of the NetGuide magazine, and we became the proud sponsor of the NetGuide best ISP award – which was won by Orcon. Also in 2011, we moved to a brand new head office located at the Cobham Drive Retail Centre in Kilbirnie along State Highway 1 near Wellington Airport. In 2015 we launched our phone based support service, the Geek Hotline. The Geek Hotline is a membership based service that provides a place for our customers to call if they need computer questions answered immediately, or someone to sort out those annoying technology niggles that aren’t worth getting a mobile technician out for. We opened in Dunedin in 2016, responding to customer feedback suggesting there was a need for our services there. So far we have been getting a great response from the local community.